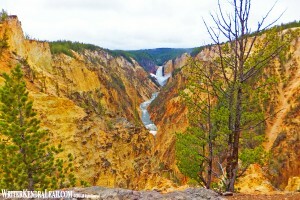 View of the Grand Canyon of the Yellowstone River and Lower Falls from Artist Point. If you have never been to Yellowstone National Park, it is only about a 40 minute drive away from Grand Teton National Park and I highly recommend taking a day to hit some of the highlights there. This is definitely a day trip as you do not get anywhere fast in Yellowstone (why would you want to?) due to the traffic and the massive size of the park. As in Grand Teton National Park, spring and fall are definitely less crowded. Head north on John D. Rockefeller, Jr. Memorial Parkway which takes you to the south entrance of Yellowstone. The entire drive is beautiful. You will be amazed at how far north Jackson Lake extends, it seems to go on for miles and indeed it does. There are many pull-outs along the way providing ample opportunities for beautiful photographs of the Tetons and Jackson Lake from this vantage point. After passing Jackson Lake, you will start to descend towards the Snake River Valley. The Snake River flows into the north end of Jackson Lake and you will want to stop and take pictures of the valley before you cross the river and continue on to Yellowstone. The last gas station you will see for quite a while is located at Flagg Ranch shortly after you cross the Snake River. If you have not already filled the gas tank, you should do so now. Before you know it, you will be climbing again. When we were in the park in 2003, this area had been recently burned in a large forest fire. We were absolutely amazed in 2012 at the dense, new population of pine trees. A reminder that the forest renews itself. As you travel further north, the east side of the road will drop off. Look over the edge. You are looking down on a canyon carved by the Lewis River on its way to empty into the Snake River. You will definitely want to pull over at the overlook to take in the beauty. A little further up the road is Lewis Falls and Lewis Lake. Are you starting to understand the other reason you will not get through Yellowstone quickly? There is just so much beauty to see and revel in that you will want to set your mind for a relaxing day of driving with frequent stops to stretch your legs. The park covers 3,472 square miles. At this size, you can not do the park justice in one day. If this is your first trip to Yellowstone and you are only planning one day for the park, two must sees are Old Faithful and the Grand Canyon of the Yellowstone River at Yellowstone Falls. Shortly after you pass Lewis Lake, you will have the opportunity to swing into Grant Village for gas, snacks, and a restroom break. Before long, massive Yellowstone Lake will come into view. The lake encompasses 136 square miles and is the largest lake in the park. 22 miles into the park, the road forks. Stay to the left on the West Thumb and continue on to Old Faithful (you will get to see more of Yellowstone Lake on the last leg of your journey). When you arrive at Old Faithful go directly to the visitor center to check the clock for the next estimated eruption time. If you are lucky, you may have arrived within 10 minutes of this time. You do not want to miss this as the next eruption will be approximately 60-110 minutes from then. If you have just missed the most recent eruption, take time to grab a bite to eat, visit the gift shop, and explore the exhibits in the visitor center. After viewing Old Faithful, continue north through Upper, Midway, and Lower Geyser Basins. There are walking trails throughout these basins. Take your time and enjoy Sapphire Pool at the Upper Basin, Grand Prismatic Spring at Midway Basin, and the Paint Pots of the Lower Basin. Be sure to heed the warnings and stay on the wooden trails throughout this area. You do not want to disturb this fragile ecosystem, and the ground can be unstable and dangerous to walk on. From this area, continue north to Gibbon Falls for a picture taking rest stop. Before you get to Gibbon Falls, you will see the road to the West Entrance. Do not take this road, stay to the right and follow the road towards Norris. As with anywhere in these parks, be on the lookout for wildlife as you enjoy your scenic drive. At the very least, you are sure to spot the bison herd on your travels and quite possibly elk, moose, grizzly bears, and more. When you arrive at Norris, take the road heading east towards Canyon Village. You are now on your way to the Grand Canyon of Yellowstone and the falls of the Yellowstone River. Turn south from Canyon Village and follow the signs to the falls. There are several pullouts that overlook the canyon and falls. Look for Inspiration Point, Grand View, Lookout Point, and Uncle Tom’s Trail. One of the best vantage points is from Artist Point (photo above) and if I were only going to stop at one, this would be it. The canyon and falls are amazing. Be sure to stop at both the Lower and Upper Falls. The spectacular Lower Falls are 308 feet high plunging into the canyon which is up to 1,000 feet deep. While the Upper Falls may seem small in comparison, at 109 feet high they are still a very worthy site. From the falls, continue south following the Yellowstone River through the Hayden Valley. You are on the last leg of your trip heading back to Yellowstone Lake. Enjoy the scenery and take a few moments to stop at Sulphur Caldron and Mud Volcano. When you get near Yellowstone Lake take time to stretch your legs and walk out on Fishing Bridge. While the original bridge was built in 1902, the existing bridge was constructed in 1937. Fishing is no longer allowed from the bridge but people used to line up along the bridge to catch cutthroat trout spawning in the river below. The bridge was closed to fishing in 1973 due to the decline in the cutthroat trout population but you can still look into the crystal clear water and watch the trout swimming below. Your drive continues along the shore of Yellowstone Lake for another 21 miles until you meet back up with the road to the South Entrance of Yellowstone. Enjoy your drive back to Grand Teton National Park. You should make it back to the park in time to relax over a delicious dinner at your lodge. Minerva Terrace at Mammoth Hot Springs along the Grand Loop. Photo courtesy the National Park Service. 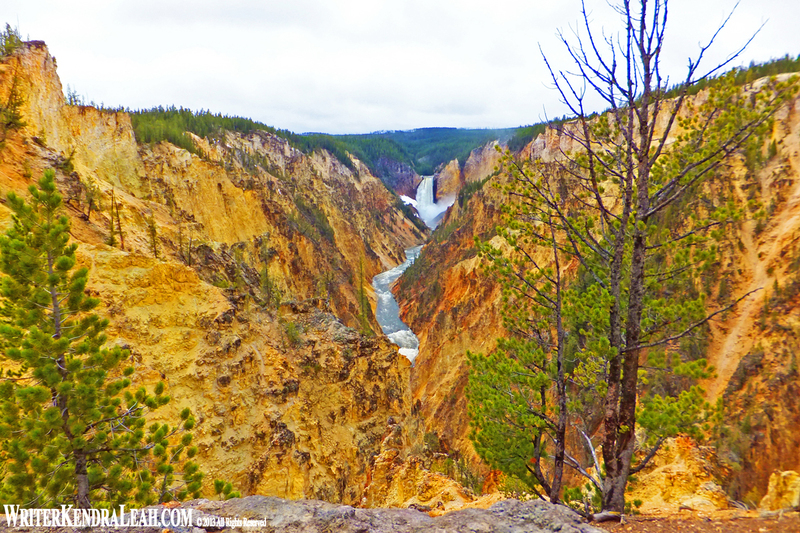 If you are up for a longer day of driving and want to take in all of Yellowstone’s highlights, head north from Norris to Mammoth Hot Springs after visiting Old Faithful, the Geyser Basins, and Gibbon Falls. 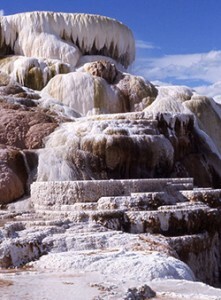 The terraces at the Mammoth Hot Springs are a unique and changing site formed by geothermal activity forcing hot water through the limestone and depositing minerals that form the terraces. Also located in this area are the Albright Visitor Center & Museum and historic Fort Yellowstone built by the U.S. Calvary. Horace M. Albright was the superintendent of Yellowstone National Park and he dedicated many years of his life to the formation of Grand Teton National Park. Construction began on Fort Yellowstone in 1891. At this time, the United States Army had been protecting the park since 1886 and it became apparent that permanent facilities would be needed. They protected the park until the National Park Service was established in 1919. From the Mammoth Springs area, continue east to the Tower-Roosevelt area. Here you will find Petrified Tree and Specimen Ridge (on the northeast entrance road), the largest concentration of petrified trees in the world. If you have time, continue on this road into the Lamar River Valley. The valley provides excellent opportunities for wildlife viewing, including bison, elk, grizzly bears, coyotes, and wolves. If you do drive into the valley, you will need to turn and go back to the Tower-Roosevelt area, then continue south to the spectacular 132 foot Tower Fall of Tower Creek. Enjoy the scenic drive south after Tower Fall until you arrive at the Grand Canyon of the Yellowstone and follow the route above for the remainder of your trip. 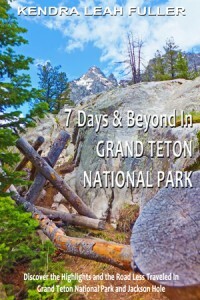 This entry was posted on Thursday, April 10th, 2014 at 5:16 pm	and is filed under Grand Teton National Park, Travel Articles. You can follow any responses to this entry through the RSS 2.0 feed. You can leave a response, or trackback from your own site.